Certain people just can’t seem to stay apart for too long. Batman and Catwoman have been entangled in a romantic game of cat and mouse (bat?) for decades now, but in this week’s Batman #32, penned by Tom King, Selina has finally decided whether she wants to marry Bruce. There was once a time when you had to wait until Wednesday morning, when the comic book stores actually opened, if you wanted to learn what was going to happen next. That time is over, apparently. 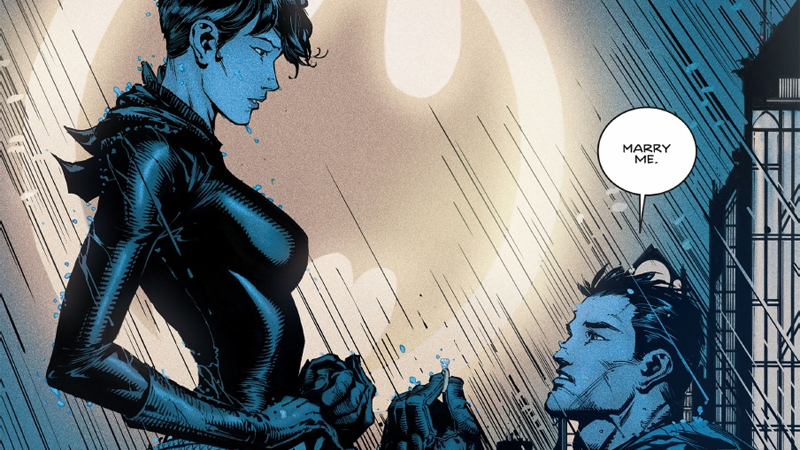 Today, DC announced to USA Today that Catwoman will, in fact, agree to marry Batman after we last saw the Dark Knight pop the question in dramatic cliffhanger. Though their decision to wed is technically news, it might not exactly feel that way considering just how often we’ve seen Batman and Catwoman as an item over the years. This is far from the first time that we’ve seen them in an ongoing (though perhaps not “official”) relationship; the pair’s Earth-Two counterparts not only got married, but ended up having a daughter together. It’ll be interesting to see what married life does to Batman and Catwoman. Maybe they’ll start patrolling together. Maybe Damien will tag along. Maybe their nightly patrols for criminals will become—forgive me for this—a family affair. Batman #32 hits stores this Wednesday.